New tour dates kick off in May. 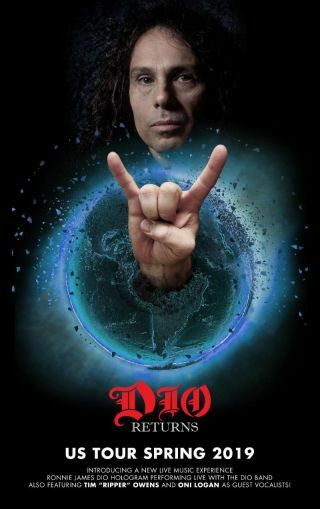 After first debuting at Germany's Wacken Open Air Festival in August 2016, the Ronnie James Dio hologram will make its way to the U.S. for the first time on the Dio Returns Tour. The inaugural U.S. trek kicks off May 31 in Fort Myers, Florida, and will wrap up June 29 in Las Vegas. The official band line-up for the shows features former Dio members Craig Goldy on guitar, Simon Wright on drums and Scott Warren on keyboards. They’ll be joined by bassist Bjorn Englen, as well as vocalists Tim 'Ripper' Owens (Judas Priest/Yngwie Malmsteen) and Oni Logan (Lynch Mob). The show will feature Dio’s biggest hits with Rainbow and Black Sabbath, as well as classic solo cuts like "Holy Diver" and "We Rock." Said Wright: "Looking forward to hitting the road with this incredible piece of technology and celebrating Ronnie and his timeless music again with his friends and fans." Tickets for all confirmed tour dates are on sale April 12 at 10:00 AM local time. Check out the full itinerary below. For more information, head over to RonnieJamesDio.com.